This post follows on from the previous two posts (30th May and 7th June), and considers where synthetic life might go in the future, and what applications might be found for it. 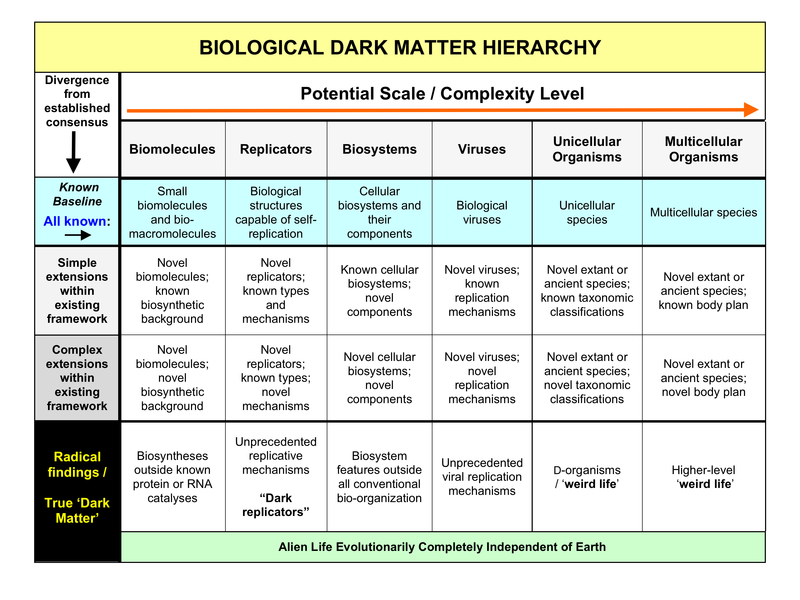 But this also harks back to earlier discussions of biological ‘dark matter’. Some of the speculations about the different forms that so-called ‘weird life’ might take may be (at least in principle) experimentally investigated through advanced biosynthetic projects. When this point is reached, a hypothetical alternative biosystem need not remain purely conjectural, but can enter the domain of experimental science. The above title is a famous quote of the renowned Nobel Prize-winning physicist Richard Feynman, which has a profound message, but is easily understood in its essence. It has been applied in many contexts, including (perhaps not surprisingly) towards the generation of synthetic life. But before focusing on this, let’s take a look at the ‘I’ of Feynman’s statement. All around us we see common-place pieces of technology such as computers, smart phones, GPS devices and many more increasingly sophisticated products of our civilization. But even those of us who can truthfully claim to understand their principles of operation could rarely if ever claim to be able to completely fabricate any of these devices from basic raw materials. This applies even to older and quite familiar technologies such as automotive engines, where the function of each part may be well understood by an individual, but not necessarily all of the manufacturing details for each component. For example, one may understand quite well the function of a conventional spark plug, but not know details of the manufacture of its ceramic and metallic component materials or how they are rendered into the appropriate shapes. As technological products increase in complexity, so too we find a corresponding increase in specialization for the production of each required component. While individual engineers might be able to specify the production of early automobiles from the ground up, this is most unlikely by the time we reach modern computers, if we include all material (hardware) and software aspects of their ultimate high-end functions. But still, as the products of humans, obviously the most cutting-edge computational systems available today are collectively understood in the most complete detail. So all that is necessary for accuracy is to replace ‘I’ with ‘We’ in Feynman’s dictum. If the complexity of even bacterial biosystems dwarfs anything artificially produced to date, then it might be presumed that a single human mind will struggle to encompass and integrate all required fields of information for a complete synthetic life project. Accordingly, a feature of Systems Biology (a topic raised in a previous post) often explicitly stated, but implicit in almost every published study, is that computational analyses of biosystems are essential to cope with their complexity of pathways and feedback loops. But another analogy can be made between Synthetic Life and the understanding of technology which is perhaps more instructive. While very few if any people could exactly specify how to prepare all necessary components of a modern automotive engine literally from the ground up, a knowledgeable engineer or mechanic could well assemble an operational engine if he or she was provided with all the necessary pre-made bits and pieces. In addition, at least within the operations of a single manufacturer and a particular type of car, many specific components may be interchangeable between different models. It is this principle of modularity which is very often encountered in living systems. This concept has been embraced by practitioners of synthetic biology, where ‘biobrick’ components of more complex systems are constructed for the purpose of plugging in as mix-and-match parts to deploy and rearrange at will, to produce pre-defined functional biosystem outputs. 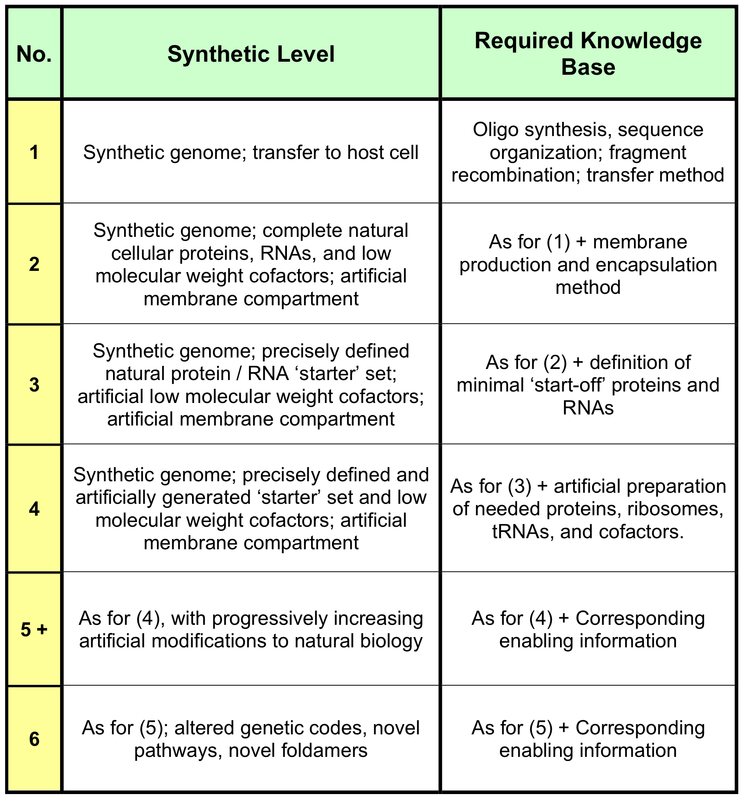 In the first post of this Synthetic Life series, a progression of synthetic levels was noted. Moving from the beginning to the end of this list correlates with decreasing ‘copying’ of natural systems and increasing levels of artificial novelty. Ultimately, a biosystem which operated under completely novel and non-natural principles would constitute the most compelling circumstances for paraphrasing the above Feynman quote by stating “I have created it (life), and therefore I understand it.” (At least where we understand ‘I’ to operate in a collective sense using advanced computational power). But between such a radically distinct creation and a slavish re-creation of a natural system lies a wide gray area. For example, while the synthetic genome made by Venter and colleagues (discussed previously) copied most of the natural genes of the chosen Mycoplasma species, it certainly was not an exact copy of the natural model genome, bearing deliberate alterations at sites known to be compatible with continued genomic function. But as also noted in the same earlier post, there is a long way to go beyond genome synthesis per se before the heady fields of complete synthetic biology are reached. Now an important counterpoint must be introduced: the inverse of Feynman’s aphorism is not necessarily true…. ‘If I fail to make something, then I don’t understand it – but if I don’t understand something completely, it doesn’t necessarily mean that I can’t use its components for re-assembling it, or for making something else’. Once again, we have to distinguish understanding at an idealized fundamental ‘ground up’ level from a broader understanding of system components. Provided with a set of modular ‘bricks’, a structure may be produced without necessitating a complete understanding of how each brick was itself derived. Once again, the Venter group’s synthetic Mycoplasma genome can be illustrative. Here a completely synthetic genome ‘booted up’ a recipient host cell, but at the time of performing this, a significant fraction of the cellular proteins expressed from this genome had unknown functions. It should be clear, then, that this genome was created, but obviously not fully understood. Yet even when the stage is reached where a fully synthetic cell is designed ‘from scratch’ and successfully ‘booted up’, another issue arises. In principle, a complete systems biology should be able to predict the ‘complete phenotype’ of an artificial genetic system. But even if you do know the functions of all proteins and RNAs in isolation, it does not necessarily follow from this alone that you fully understand the function of the entire system once it is operational. In practice, the complexity of even simplified biological systems is such that the unexpected may have a strong tendency to pop up. Even in bacterial genome minimization studies (described in the previous post), such emergent properties have become manifest. Some of the properties of E. coli cells with a 15% genomic size reduction were not only unexpected and unpredicted, but also beneficial, such as improvements in the propagation of otherwise-unstable plasmids. But another way to solve problems arising in the design of synthetic life is via powerful techniques of mass screening of combinatorial variants and directed evolution. This approach leap-frogs over complexity of finding the best accommodations between a multiplicity of cellular pathway components, by constructing large libraries of variants and applying powerful screening or selection systems to ‘pull out’ library members (specific variant cells) with desirable functional characteristics. This technique has found considerable utility and application in metabolic pathway engineering. With an evolutionary strategy, the starting-point library of variants and iterative selection / screening conditions are defined, but at the outset the nature of the desired variant if not known. Once again, ‘creation’ of a useful entity is thus decoupled from a full understanding of all initial conditions. It should be emphasized, however, that an evolutionary approach itself can be rationally focused on the most relevant components of a system, where pre-existing knowledge thus becomes extremely important. In fact, such focusing is often essential in practical terms, given that broad-spectrum randomization of complex systems creates such hyper-astronomical numbers of variants that effective screening is impractical. As we design, we learn. As we evolve and screen systems, we also learn. And knowledge gained in such ways feeds back into these processes, further streamlining them for future projects and ultimately leading to closer and closer approximations to fully rationally designed complex biosystems, or ‘rational synthetic life’. A loop between evolutionary / empirical means, the acquisition of more knowledge, and the future ability to apply such knowledge for rational synthetic life design. While a cellular pathway which emerges from repeated rounds of a directed evolution experiment is obviously not described in advance, once the desired variant is in hand, it will always be subjected to an exhaustive functional dissection for the purposes of understanding how the beneficial features arose. This kind of evaluation from an existing system is often termed ‘reverse engineering’ from artificial precedents which are conceptually extendable to complex biosystems. Previous posts discussed notions of ‘weird life’ and how it might be constituted. In the continuing absence of natural proof-of-principle cases, the feasibility of any postulated life-variant will remain conjectural, even for those deviating relatively conservatively from the familiar Life 1.0. But when synthetic biology reaches a platform of sufficient power and versatility, these questions will become amenable to experimental testing. A couple of examples are given below. In previous posts, we’ve looked at the postulated RNA World stage of early molecular evolution (5th April) and the requirement for ribozyme replicases for such a world in order for sustainable replication of RNA genomes. A logical extension of this is to propose that membrane bounded self-replicating ‘cellular’ RNA-based entities, or ribocytes, once were also a central feature of the RNA World. To be feasible, an array of reasonably efficient ribozyme activities would need to exist, but these could be grouped into a minimal set of functional classes, as shown in the diagram below. 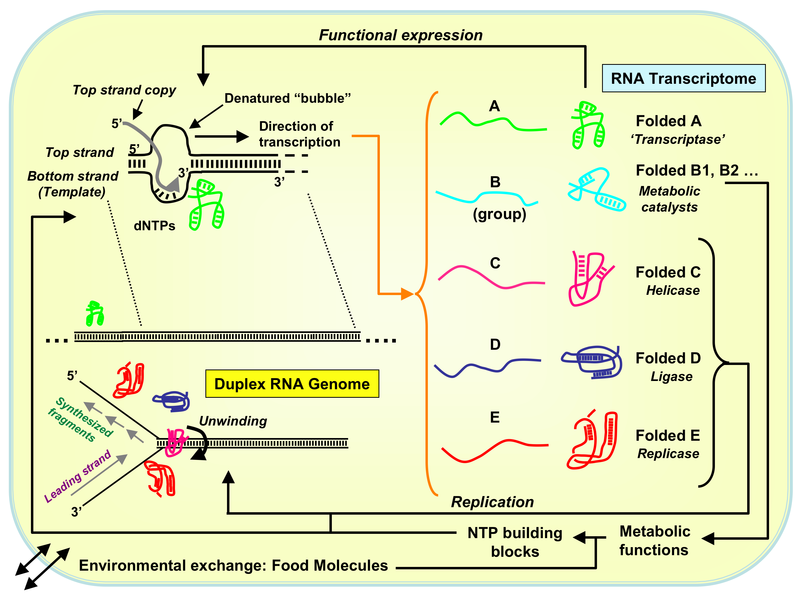 Ribocyte description: This diagram shows some minimal ribozyme activities logically required for a self-sustaining and self-replicating ribocyte. It assumes the following points: (1) A duplex RNA genome where both strands are replicated by the same ribozyme replicase. Duplex unfolding requires a ribozyme helicase, and a ligase for joining short (lagging strand) newly synthesized RNA fragments; (2) A separate RNA transcriptase to generate single strand transcripts from recognized start and stop signals within the genome. These transcripts fold into functional RNA molecules as shown; (3) A set of ribozymes (‘B group’ here) mediating all necessary ribocyte metabolic activities. The form of the ribocyte genome shown here is purely for schematic purposes; it could be depicted as existing in various forms, such as a set of associated short fragment duplexes. With the exception of a limited number of precedents for natural ribozymes, traces of the RNA World are believed to have been expunged by billions of years of evolution. But many ribozymes with diverse functions have been obtained in the laboratory, and artificial ribozyme RNA polymerases have been recently taken to new heights of efficiency. But these successes by no means prove that ribocytes ever existed, and the ribocyte proposal is far from universally accepted. So, since no-one has the slightest expectation that anything like ribocytes could still exist even if they once did, it behooves advanced synthetic biology to address the question directly. That is, try to make a functional ribocyte by artificial means, and then test its capabilities. (It is not suggested that an engineered ribocyte would necessarily have to conform to the above diagram mechanistically). It should be noted that even if the above schematic generalized ribocyte is utterly fanciful as a real product of evolution, it does not necessarily follow that it is physically impossible. Certain potential biosystem configurations may never have been explored as ‘options’ for the blind processes of molecular evolutions, for various reasons. Among these are constraints which may be placed on evolutionary pathways by lack of suitable intermediate forms which provide a naturally selectable fitness increase. However, an unfeasible evolutionary pathway from state A to state B does not mean that the latter state could not be attained by artificial synthesis. (And note that this is a generalizable point with respect to any physically feasible biosystem which has never been realized by natural evolution). In a previous post discussing biological chirality and ‘weird life’, the well-visited theme was raised of living organisms possessing biomolecules with inverse chirality to that which we are familiar. A potent way of studying the functional limitations of biological stereochemistry will be to attempt to create a cell with flipped chirality for amino acids and sugars. If it becomes possible to create a truly ‘ground up’ synthetic cell which mimics a natural counterpart, then in principle it should be feasible to perform the same procedure with entirely chirally switched materials. The resulting cell would be an artificial rendition of the ‘shadow’ inverse organisms hypothesized by Paul Davies and others (as previously discussed). Assuming this is possible, such artificial organisms could find many useful applications in the large-scale synthesis of D-proteins or metabolites with opposite chiralities to normal. They might also warrant tight controls over their distribution for safety reasons, especially if they were equipped with isomerase enzymes which enabled them to use normal L-amino acids and D-sugars as food sources. Such ‘alien’ organisms might replicate with impunity in normal multicellular hosts, and become a formidable management problem if not properly controlled. Among many other studies which could be envisaged, we could think of organisms with a variety of globally altered genetic codes, as molecular biological experiments. Numerous extensions to the natural genetic code in vivo have been engineered already, where natural rarely-used or stop (nonsense) conventional codon triplets (or even 4-base unnatural codons) are co-opted to function as codons for novel orthogonal pairs of tRNA molecules and aminoacyl tRNA synthases, where the appropriate tRNA becomes charged with an unnatural amino acid for insertion into polypeptides at desired positions. An advanced synthetic biology program could take this to another level, where the entire translational machinery of a bacterium is altered such that code ‘flips’ or other desired changes are instituted. These examples could go on and on…..
As the ‘knowns’ within biology expand and the domains of the enigmatic, undefined and uncertain correspondingly shrink, more and more the practice of biological science will be concerned with ‘making things’ rather than purely analyzing natural systems. It has been noted that synthetic biology should be currently considered as a research strategy, rather than a field in itself, but this need not always remain the case. In this respect, an interesting analogy has been noted between the growth of organic chemistry and synthetic biology. In the 19th century, organic chemistry moved from a purely descriptive and analytic phase to one of active synthesis, and this trend continued into the succeeding century (and this one as well) at an explosive pace. A major milestone in this regard was the synthesis of the simple compound urea by Friedrich Wöhler in 1828, since at the time it was still believed that organic compounds could only be made by living organisms (the doctrine of vitalism). Wöhler’s studies inaugurated a deluge of work which completely and rapidly discredited vitalism, and organic chemistry has long since become a mature sub-discipline within the broader field of chemical science. By the same token, it may be inferred that we are on the threshold of parallel advances in synthetic biology, where the ‘impossible’ synthesis of life will become equally unremarkable in itself as for the generation of complex organic chemicals in the laboratory. And like organic chemistry, synthetic biology will be able to create all manner of things ‘new under the sun’, only at much higher levels of complexity. And these undertakings will necessarily include what otherwise might be regarded as biological ‘dark matter’, including artificial biosystems with increasingly radical differences to conventional Life 1.0. Successful demonstration of an artificial ‘weird life’ would not, of course, prove that it has ever arisen naturally. But these questions too can be rationally addressed if plausible pathways for the origin of conventional life are defined and themselves experimentally replicated. As this information and practical modeling is increasingly refined, it should become feasible to place estimates on the probability of alternative pathways occurring under defined natural conditions. It may well be, of course, that certain living systems which are proven to be physically feasible by artificial ingenuity have a very low chance of arising naturally. Perhaps there are no limits on the possible numbers of such distinct human-generated biosystems. Perhaps that question too will one day be heatedly discussed by future synthetic biologists, but engineered variation within even a limited set of artificial biologies would surely keep such workers busy for a very long time. And in consequence, it will be clear that the bounded ‘box’ of natural biology has opened up into a practically infinite arena of creative human endeavor. And its achievement will soon be in hand. ‘…a famous quote of the renowned Nobel Prize-winning physicist Richard Feynman applied in many contexts, including (perhaps not surprisingly) the concept of synthetic life.’ This sentence is said to have been on his blackboard at the time of his death (quoted in The Universe in a Nutshell, by Stephen Hawking. (Bantam, 2001). .
‘…… ‘biobrick’ components of more complex systems……’ See Endy 2005 and Shetty et al. 2008 for discussion of modularity in synthetic biology, including biological ‘parts’, or biobricks. .
‘………would constitute the most compelling circumstances for paraphrasing the above Feynman quote…’ This point was made by Steven Benner, a renowned chemist and synthetic biologist, who has stated, “Chemists believe that if they can reproduce biological behavior without making an exact molecular replica of a natural living system, then they have demonstrated an understanding of the intimate connection between molecular structure and biological behavior. This would provide a chemical understanding of life.” . ‘……..the synthetic genome made by Venter and colleagues ………bearing deliberate alterations at sites known to be compatible with continued genomic function. ‘ These include identifying ‘watermarks, as previously noted. ‘……a significant fraction of the [mycoplasmal] cellular proteins expressed from this genome had unknown functions.’ In studying genome reduction in Mycoplasma genitalium, 28% of essential genes were found to have unknown functions. .
‘……Some of the properties of E. coli cells with a 15% genomic size reduction were not only unexpected and unpredicted, but also beneficial……’ See Posfai et al. 2006. ‘……another way to solve problems arising in the design of synthetic life will be via powerful techniques of mass screening of combinatorial variants and directed evolution. ‘ This area is a major theme within Searching for Molecular Solutions. ‘……technique has found considerable utility and application in metabolic pathway engineering.’ See Haseltine & Arnold 2007; also Wang et al. 2009 (George Church group). 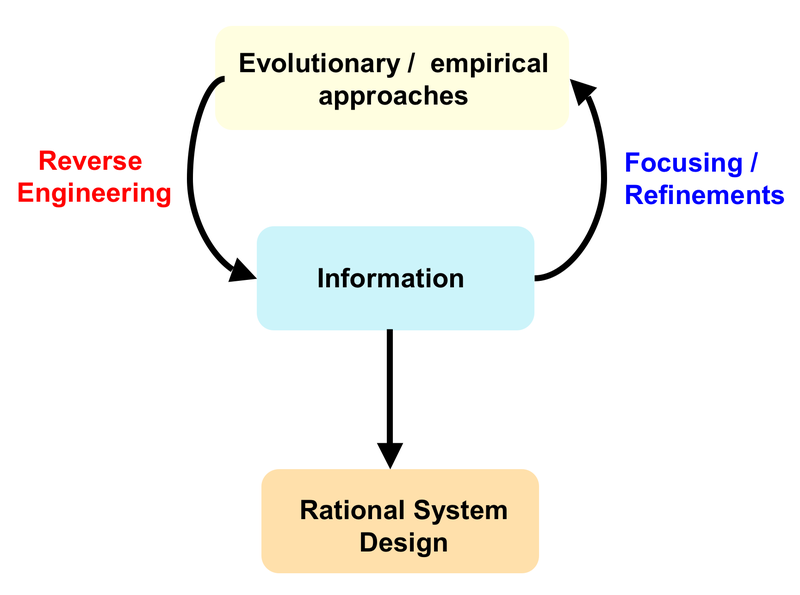 ‘……..an evolutionary approach itself can be rationally focused……’ This was also noted in Haseltine & Arnold 2007 , where mathematical pathway analysis was cited as a useful adjunct to evolutionary strategies. ‘…..interplay between evolutionary / screening approaches and knowledge based rational system design….’ This interplay effect is also considered at some length in Searching for Molecular Solutions. ‘……..termed ‘reverse engineering’ from artificial precedents which are conceptually extendable to complex biosystems. ‘ See Csete & Doyle 2002 for a general review of this principle. ‘…..ribocytes, once were also a central feature of the RNA World….’ See Yarus 2002 for a discussion of hypothetical ribocytes. ‘….artificial ribozyme RNA polymerases have been recently taken to new heights of efficiency.’ Noted in a previous post; see Wochner et al. 2011. ‘……..the ribocyte proposal is far from universally accepted.’ Some workers reject the likelihood that functional RNA molecules could provide all the necessary functions to enable complete cellular operations, or whether an RNA genome could stably segregate into succeeding generations of daughter cells (an essential requirement for stable ribocyte replication. For example, see Koonin et al. 2006. ‘….such artificial [opposite chirality] organisms could find many useful applications….’ In practice, many of such useful activities would not require an entirely ‘flipped’ cell. With extended genetic codes and specialized ribosomes which only translate targeted mRNAs, many such modified proteins can be potentially made in conventional bacterial vehicles. See Neumann et al. 2010 for an example of ribosome engineering for orthogonal gene expression in E. coli. ‘Numerous extensions to the natural genetic code…’ See Young and Schultz 2010 for a recent review of this area. ‘….synthetic biology should be currently considered as a research strategy, rather than a field in itself…’ See comments in Steven Benner’s blog. I simply planned to do stop and say thanks for allowing me to catch a look.